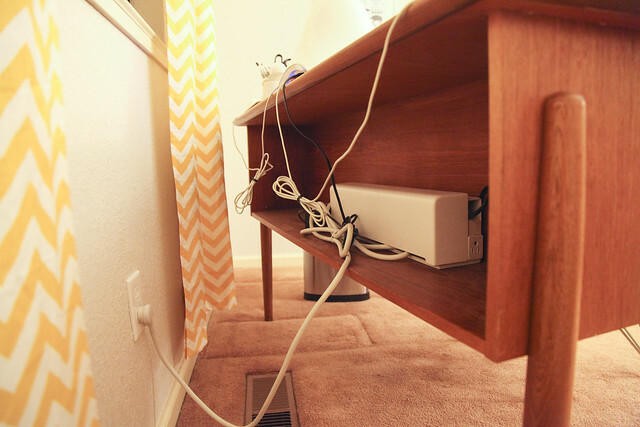 Take a look around your house and view the main cord-heavy areas from a few different angles. Select your problem areas and get to work on your plan of attack. Didn’t really have to do this seeing as Joshua broke out the zip ties shortly after we had our offices set up. 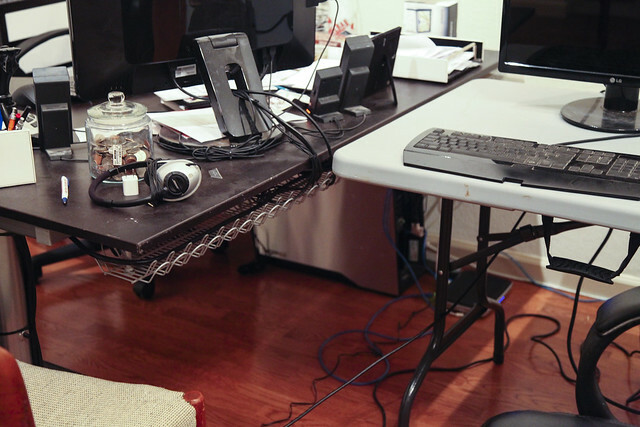 While mine hides behind my desk, Joshua’s setup is not so subtle. 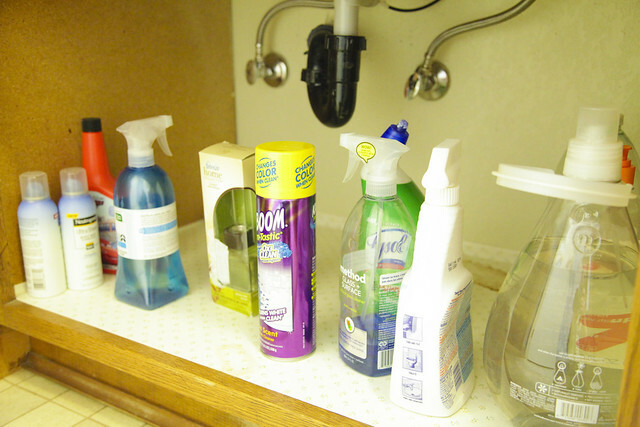 Go through your bathroom and medicine cabinets, cleaning and clearing. 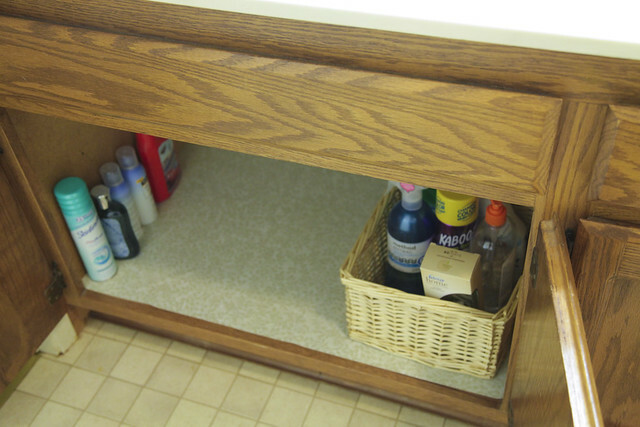 A couple weeks ago I gave my guest bathroom a decent clean-out by organizing my stuff into a couple of drawers. That was about it. 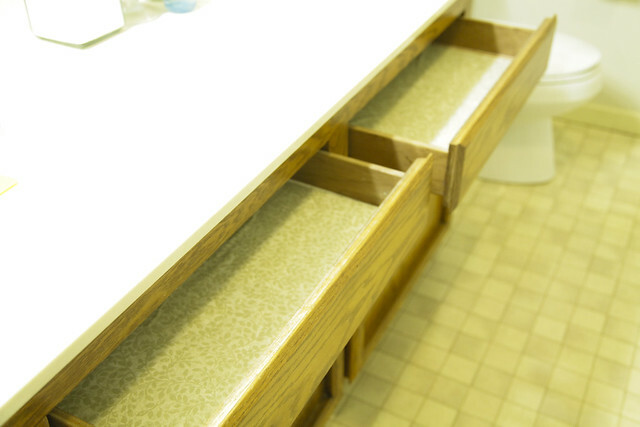 I’ve been meaning to replace the contact paper in the cabinets and a pull-out drawer for some time, so that is how I planned Day 16 of the cure. Here’s what everything looked like before I began. 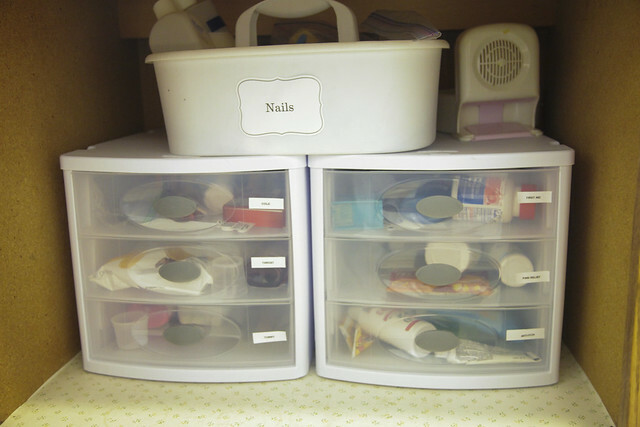 First step was I cleared out the cabinets so all that remain was the contact paper. 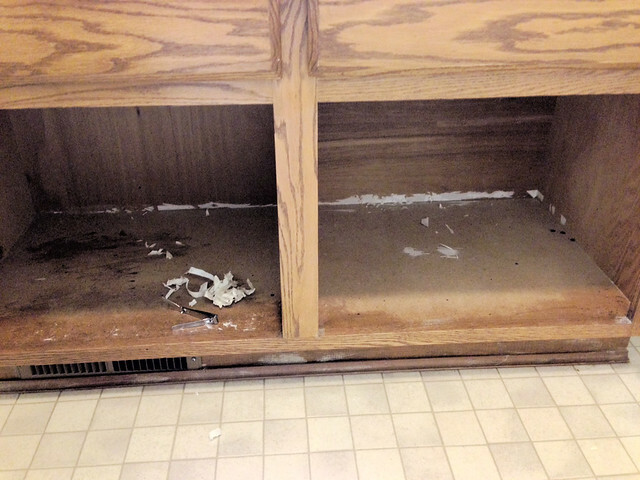 Then cabinet-by-cabinet, I peeled the contact paper off. The first cabinet’s contact paper peeled off perfectly, but the other two came off in pieces; it was like trying to get the wallpaper off in my office room. What was supposed to be a quick contact paper replacement turned into me sitting on the bathroom floor with an exacto knife trying to get the last little bits off while a hot shower was running (hoping the steam would help). I eventually gave up, sprayed some Goo Gone on it, and called it a night. When I came home from work Thursday I was back at it again, trying a Magic Eraser and a hair dryer. I finally called Joshua in for assistance in which he got the remaining paper off with a few razor blades and a lot of patience. 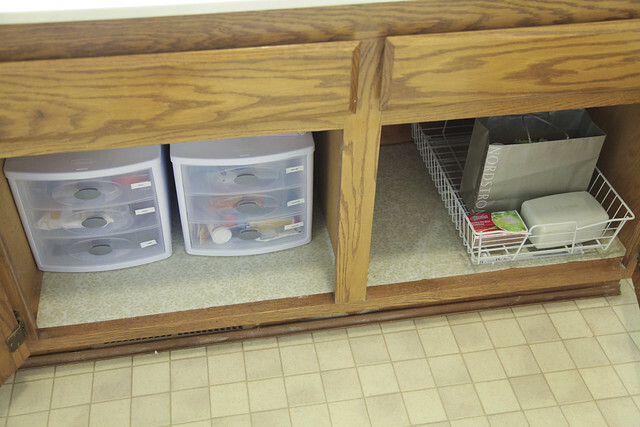 By the end of Saturday, here’s what the cabinets and drawers finally looked like. 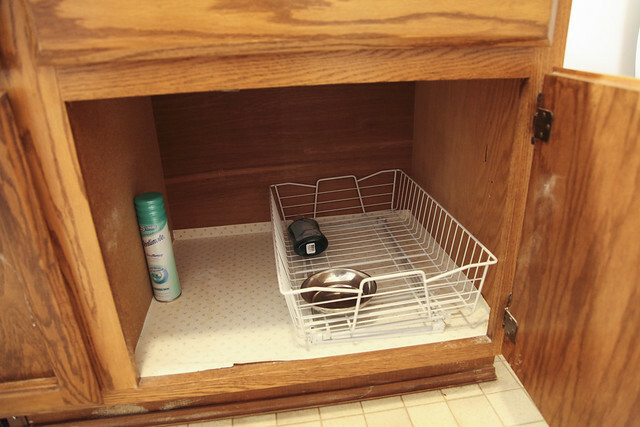 As you can see, my cabinets and drawers are a bit empty. I went from living with very small bathrooms to two huge ones. With time, I’m sure I can find more items to put in there. Assess your living room lighting. … Make note of what you need to improve your current set up and add it to your shopping list to deal with on the weekend, if possible, or ASAP afterwards. We only have one light in our living, and it’s this one. My sister thinks it looks like the martian brain from Mars Attacks!. We almost never use it because it’s super bright and harsh. Instead, we’ll flip the dining room light on in the evening if it gets too dark for us. We could have set up our lamps from when we lived in our previous house, but they were hard to reach from the sofa and we don’t have the room on either side of the sofa right now. 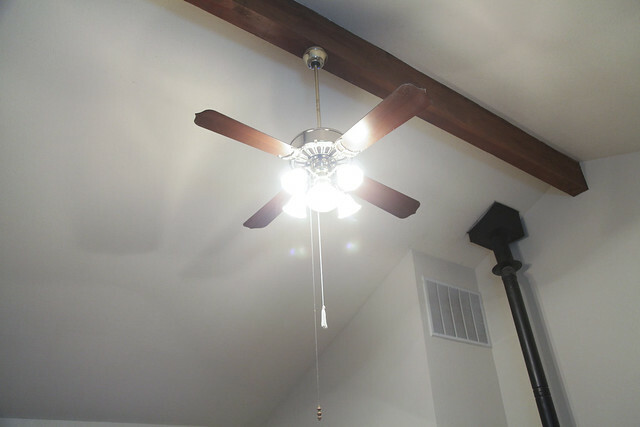 Until we get a new sofa, coffee table, and possible side tables, the solution to the lighting is to get a more modern ceiling fan that either has a dimmer or softer light. Flowers were bought, the Outbox gets emptied on Thursday (donation pick-up day) and the living room got some attention, some of it immediate. Joshua and I started Saturday by visiting various appliance stores to look at electric cooktops. I have many reasons for wanting to replace my gas cooktop with my electric one, but it mainly has to do with the fact that it currently takes 45 minutes to boil a pot of water vs 10 minutes on my old electric stove. Ain’t nobody got time for that. Somewhere in between visiting stores we started looking at new sofas. We’ve talked about getting a sectional for awhile, so we eventually began stopping at various furniture stores and testing some out. We determined we want an L-shape with a chaise in a dark grey (not leather). We found a few possibilities, so we’ll probably do some more looking this weekend. And, if you want to take the Cure even further this weekend, consider making any of the living room lighting updates or changes you’ve planned based on your lighting assessment yesterday. 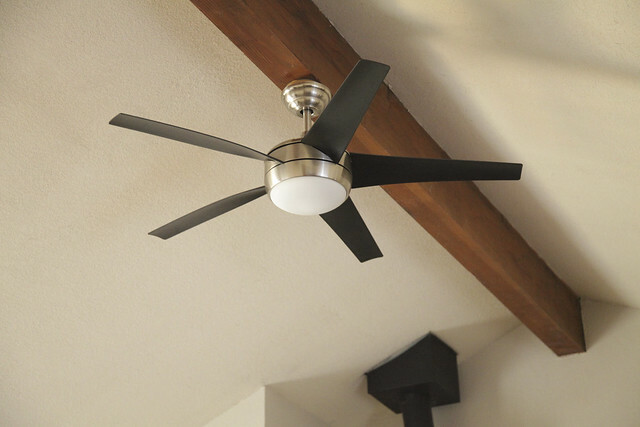 We made a quick stop at Home Depot for some unrelated living room items, but we wound up finding a new ceiling fan! This one doesn’t have a dimmer, but it has a soft light. It also comes with a handy-dandy remote control and puts out a lot of air when the fan is on. We’ll probably get another one of these for the entertainment room since it has the same fan as the old living room one.